Whenever you find your property value has been raised to the market value and it holds the relevant justifications to increase the lease and mortgage value, you immediately need to write or fill in an Appraisal Forms that is available on the web on various sites. The written report is legally acceptable and can be useful in a longer term. The only catch is that you should hold the justifications of why the value must be increased and the current market trend too. 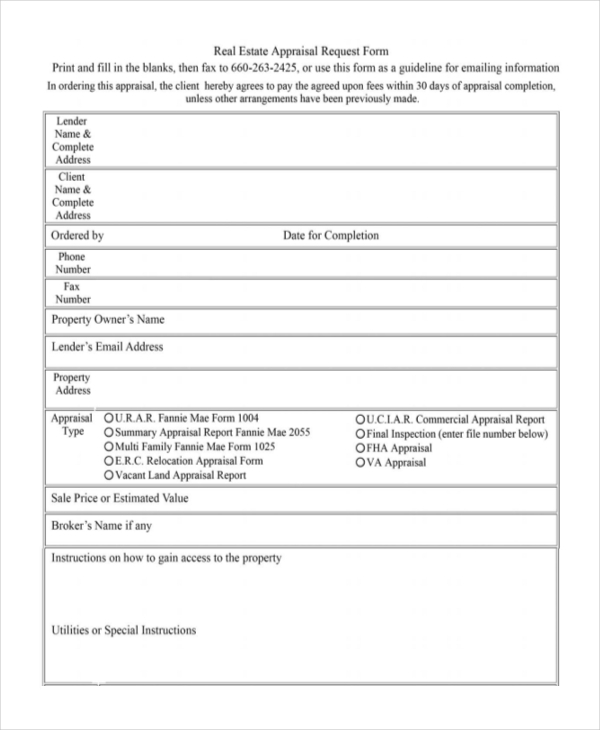 This form, that is filled with the client and the property details, and the lenders’, is also considered as the authorized statement by the client, which says that he agrees upon the fee within 30 days from the very day of appraisal completion. In case the contrary happens, the other arrangements will be taking place. You may also see Land Appraisal Forms. 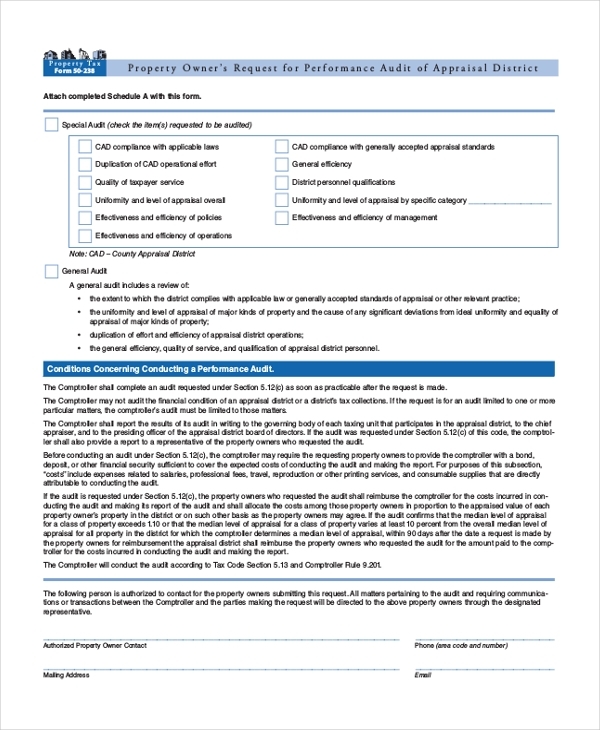 If you find your property, commercial or residential, to have increased its value, these blank appraisal request form is the very first thing you must be thinking about. 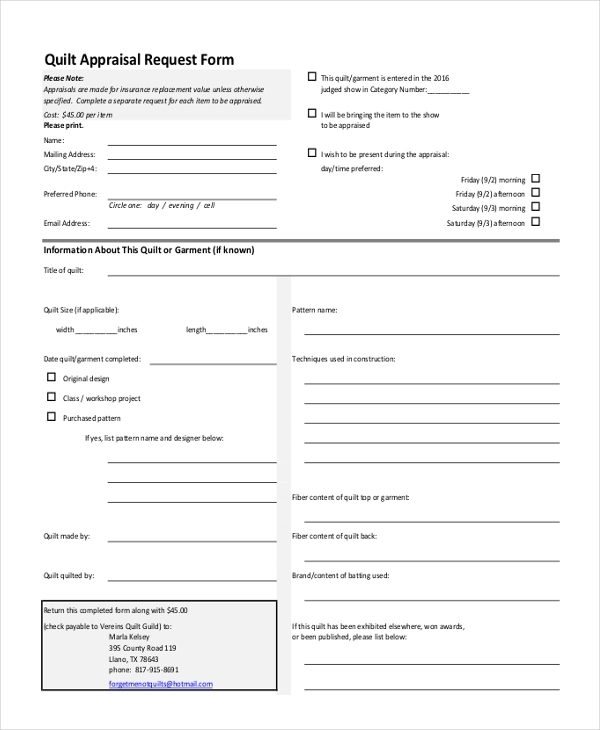 Fill and submit this form as a request for the property value. If you are looking to get an appraisal done on a piece of a commercial property that you own, even if you are planning on buying or selling, establishing the value of the lease is pretty important. 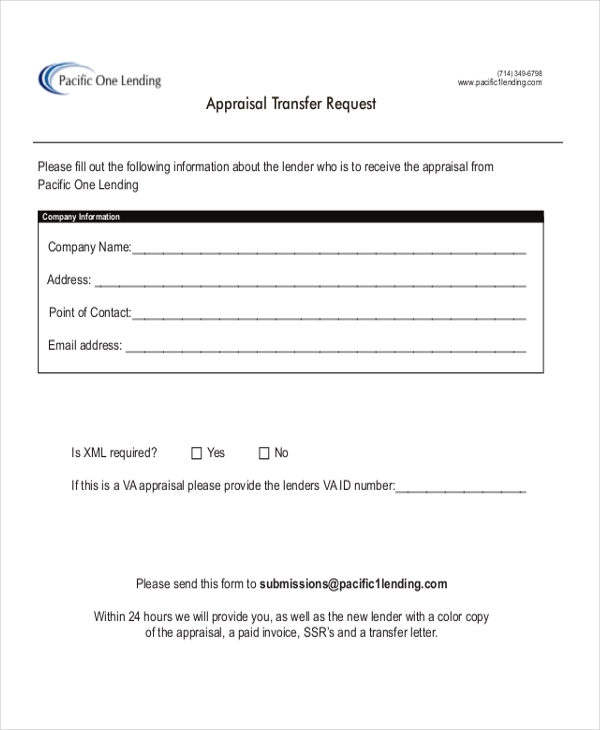 On that case, this commercial appraisal request form comes into use. You can also see Sample Vehicle Appraisal Forms. 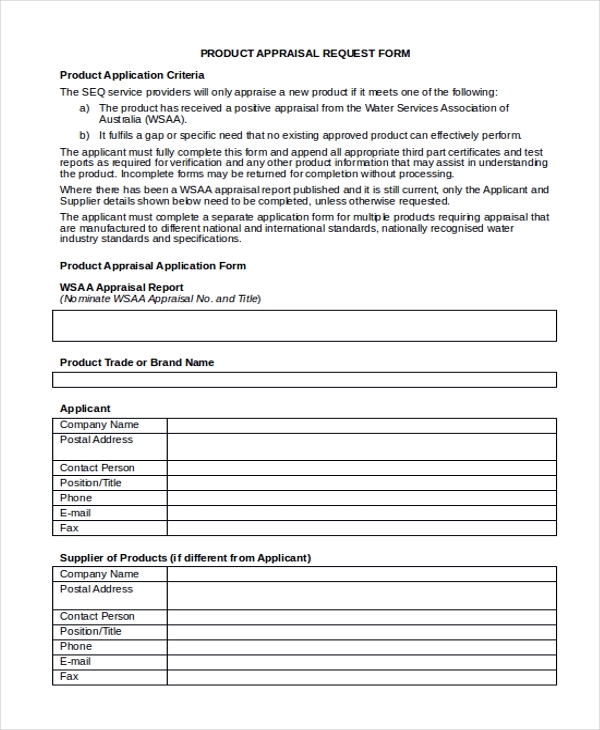 This particular order form is a kind of engagement agreement that confirms the information on the client, his intended use, intended users and any other special instructions in case of any misinterpretation found. Just as the name says, this is used by the particular person who owns the property and finds his property has raised its worth more in the market value. The owner could request for an appraisal of value for his property. You can also see Sample Car Appraisal Forms. Not only on the properties like commercial and residential ones, one can also claim an appraisal or request for the same for one’s product. If you own the product or would like to buy or sell it, this request form would be of greater use. 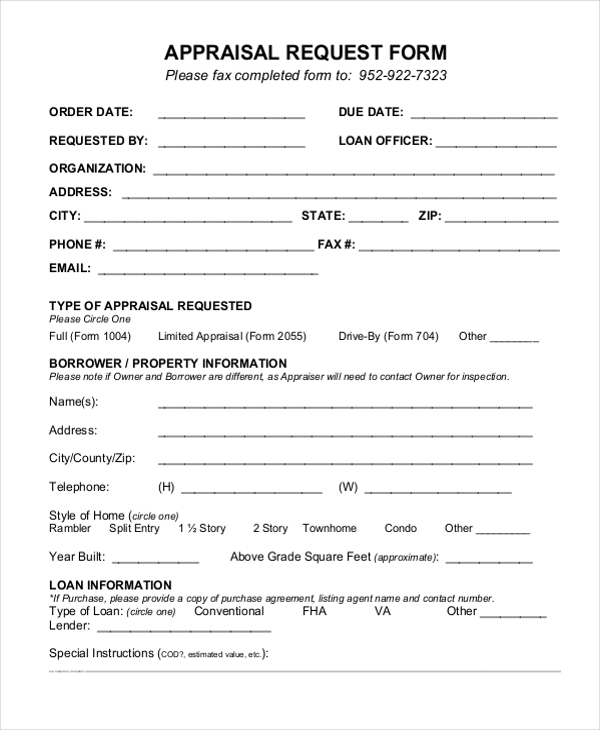 On a majority basis, this residential appraisal request form acts in a role when it comes to the lease agreement and mortgage values. 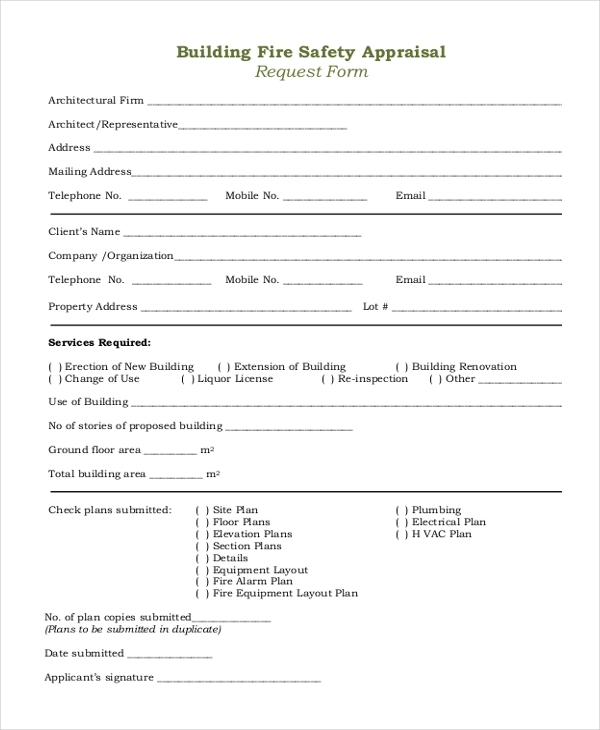 Getting these residential forms authorized can help in a long run. This is for a review on the building’s fire safety issues and calculating the system costs while still at the planning stage. This could help you in achieving the building regulations approval with a better flexibility on cost section. With a transfer letter from the lender to prove the appraisal has been released to the concerned new one, appraisal files in different formats should be attached with this to make it legally accessible. 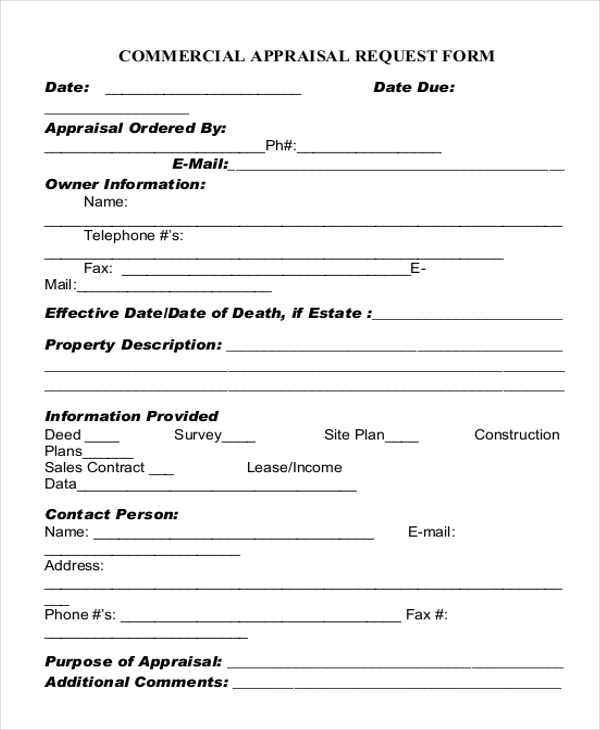 Appraisals obtained through this form are specially made for insurance replacement value. Here, you can also specify each item that needs to be appraised. Quilt’s design and size and title also need to be specified here. 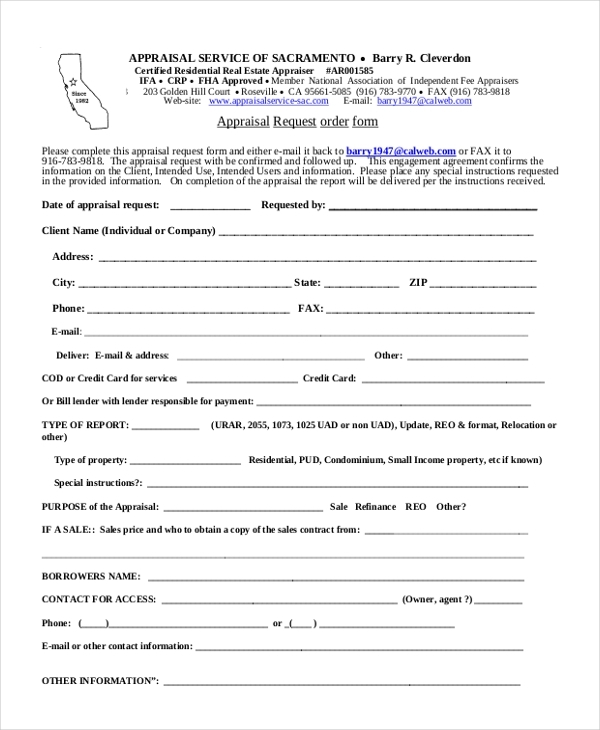 An appraisal request form, also known as change order request forms is a written report states the price or price range of a property or a product like a quilt or any garment if you are planning to sell the same in today’s market. This is not exactly a valuation. The valuation can be completed by only a licensed valuer. It is important that an appraisal is conducted properly as setting the right selling price is one of the most critical elements in any property during the transaction. You may also see Employee Appraisal Forms. 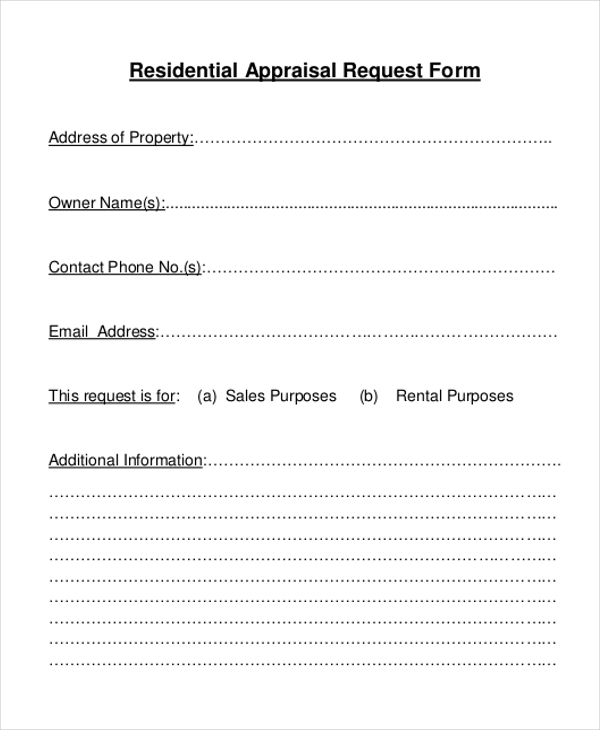 The target audience for appraisal request form is the property owner and the agent who handles it. An agent plays a role in setting a reserve price for the property. He is the one who is responsible for setting the barriers and the stage that do not scare buyers away. In this turn, the buyer also becomes one of the secondary target audience set. Also, there are factors like current bank lending policies, interest rates, and economic factors on a general note that need to be considered by the target audience. You can also see Sample Staff Appraisal Forms. A property appraisal must be taken into similar properties close by that have been sold on a recent note and the properties that currently exist in the market that could likely be considered as a possible competition for the respective subject property. All these factors, if considered, can help set the right appraisal number for the property.